From Abubakar Tafawa Balewa to Ahmadu Bello, we have lost great leaders, visionary leaders, selfless leaders, who are there to protect the interest of their people, to provide sustainable development for their people, to improve the standard of living of their people. What we have today, I can’t regard as leaders because they lack the features of one. A leader is one who commits himself, his efforts and time for the well being of his people. To our biggest surprise, which shocked many Nigerians especially people from the North, as the Dasuki gate opens up, names we never imagined or expected are the names that are being called. 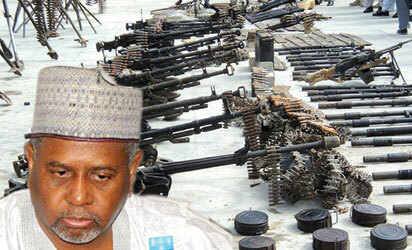 Sambo Dasuki, a person who claims to be a leader, a northern elder, a muslim leader, a person who claims the blood of Shehu Usman Dan Fodio, a person in the position of becoming the ‘Sarkin Musulmai’ of Nigeria, collected money meant for arms for the army to fight the ruthless boko haram, but used the money and shared it among our so called leaders to mobilize support for GEJ’s reelection, and some other reasons. To me, I strongly believe Igbo leaders will never do such a thing. They will never collect money meant for security of the lives of their people for their own selfish interest. They will resist and reject it, and they will fight for their people. They can never dare collecting money which will result to loss of lives of their people, and made homeless and displaced. Northern leaders like Alh Attahiru Bafarawa, Amb Bashir Yuguda, Yerima Abdullahi, Sagir Bafarawa, Mr Shu’aibu Salisu, Aminu Buba-Kusa, Barr. I.M. Bala, Hon. Bello Matawalle, Dalhatu Inv, Bello Halliru, Tanko Yakasai, and one who came as a surprise to Nigerians, a very close friend of Buhari, a trusted and respected person in place of rtd Gen. Lawan Ja’afaru Isah are supposed to defend the interest of their people. However they went on sharing the fund meant to fight Boko Haram with. Many lives were lost because necessary measures were not taken, many children made orphans, many women made widows, many girls abducted, millions displaced and made homeless, and millions of lives changed negatively. How can you justify your actions? What will you tell your God? What will you tell the people? Indeed you have committed grave sins to your people and to your Lord. I am not saying all Northern leaders have the same character – some are selfless, and corrupt free, and will never engage themselves in such act. We have some to be proud of, people like Gen Muhd Buhari, Engr Dr Rabiu Musa Kwankwaso amongst many others. Therefore, I recommend that every Nigerian leader that is charged with corruption, and found guilty, should be banned from getting or contesting for any public office ever. Also, anyone with a criminal record should not be allowed a public office. Written by Aliyu Bello, Student of Political Science. Bayero University, Kano state.